This is a common question most clients want to know. Car accident cases can settle at different times. The range can be anywhere from a couple months to a year after an accident. When your cases will settle depends largely on many case factors our lawyers need to analyze. What is the severity of injuries? What are the long term consequences ? In serious injury claims where a lawsuit or litigation is required there is more information that needs to be discovered. Insurance companies will generally not pay significant money damages until all of their questions are answered. Similarly, as lawyers we are unable to settle a case until the full nature and extent of a client’s damages are fully understood. Is our client going to make a full recovery? Or will they be left with a permanent injury that affects them over the course of their lives? A good lawyer will not overlook these answers. In more routine cases or where insurance coverage available is limited or where injuries are not as serious then cases can settle more quickly. When your case will settle depends a lot on you. By this, we mean the severity of the injuries and case and the amount of damages claimed. When you hire Gerson and Schwartz, PA we will do all we can to settle your case as quickly as possible. But as a general rule, pre suit cases where no lawsuit is filed can settle 3-6 months after a client has finished with medical treatment. Once a lawsuit is filed the process takes about one year or more. Because no two cases are alike, we encourage all clients to discuss these questions about when your cases will settle since no two cases are identical. What if There is not Enough Insurance to pay my Car Accident or Injury Claim? This is a common problem that most car accident victims don’t always understand. Under Florida law, motor vehicle operators are not required to carry bodily injury insurance coverage. This means that the vehicle operators may have coverage but they are not required to protect themselves for injuries caused to another. What this means is that if an uninsured or underinsured driver causes an accident resulting in serious bodily harm the at fault party may leave themselves exposed to personal liability. In situations where a Defendant that causes serious bodily injury or death but has no assets is problematic. Too many times, we have seen clients with serious injuries but not enough or very little financial responsibility. When you hire our law firm, we work hard to understand all potential sources of legal liability and financial resources that may be available. We also encourage all clients that drive to purchase uninsured and underinsured motor vehicle coverage. This can act to protect you in the event of an uninsured and underinsured driver. If you have health insurance this can pay for medical bills and expenses. But it won’t cover any amounts for pain and suffering or non-economic damages. For these reasons, its paramount to hire an experience car accident lawyer to evaluate all potential legal claims. What Should I Bring to my Case Consultation? We advise all clients to bring everything they have to a new case consultation. Whether or not you think it is important or not bring it anyway. This includes past and future medical records, witness information, photos, video, receipts, bills, letters, correspondence from insurance adjusters, property damage bills and receipts for out of pocket expenses. The more information you provide the better and will only make your consultation and time together more fruitful. No. We front all the cases costs. You only pay us back if we recover money on your behalf. 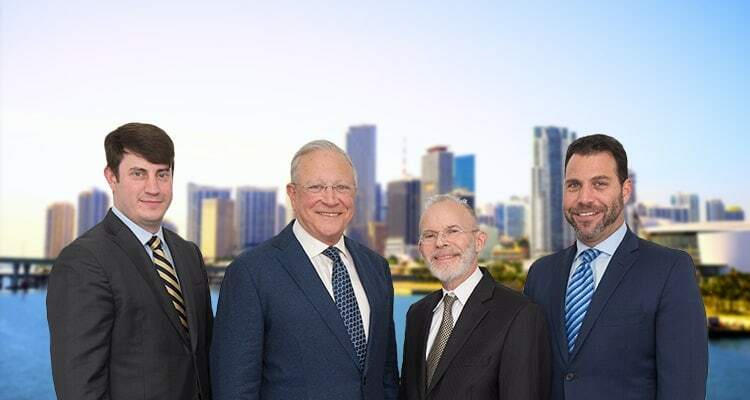 How Much Will a Car Accident Lawyer in Miami Cost? If hired to represent you for your accident and personal injury we will take your case on a contingent fee. Contingent fee agreements are essentially contracts between lawyer and client. The percentage or fee structure is set by the Florida Supreme Court. The amount of attorneys fees are based on a percentage of the recovery at the end of the case. What this means to you is that if we do not collect money, than you do not owe our law firm anything. If you have been hurt in an accident, you may be worried about how much retaining an attorney will cost you. All of our car accident cases on a contingent fee-basis. This means you only pay us legal fees if we successfully recover compensation on your behalf. The attorney’s fee structure are based on a percentage of the recovery. All personal injury law firms in Florida operate under the same fee schedule. The fee schedule is set by the Florida Supreme Court. Contingent fee agreements ensure that every accident victim and family member has access to legal representation regardless of their ability to pay up front. This allows accident and other injury victims who cannot afford to hire lawyer access to the courts.